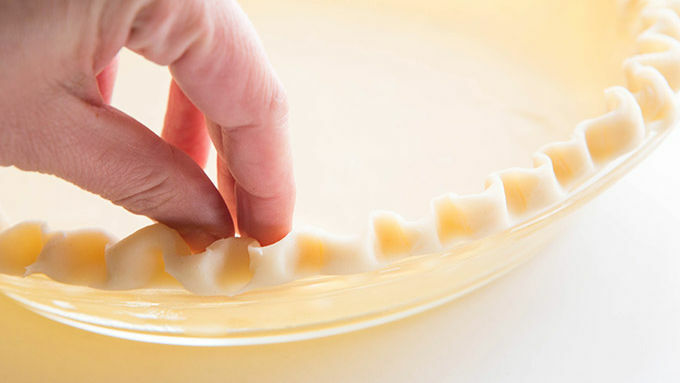 Drape a Pillsbury™ dough round into a 9 inch pie pan. Gently pinch the edges together decorative-style, and place some pie pearls on the bottom of the pan. Don’t have pie pearls? No problem! Toss about 1 1/2 cups of dry pinto beans into the bottom of your pie crust before baking. In a stand mixer or large bowl beat cream cheese until smooth and creamy. Add sour cream and 3/4-cup sugar. Beat until smooth and well combined. 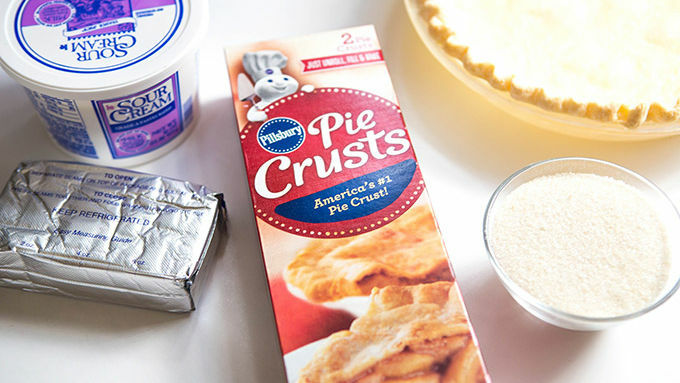 Spoon into prepared pie crust. Refrigerate until topping is prepared. In a saucepan over medium high heat, stir together remaining 1/2-cup of sugar, orange liqueur, fresh cranberries and pumpkin pie spice. Bring to a boil, stirring constantly allow to boil for 1-2 minutes. Remove and cool completely. 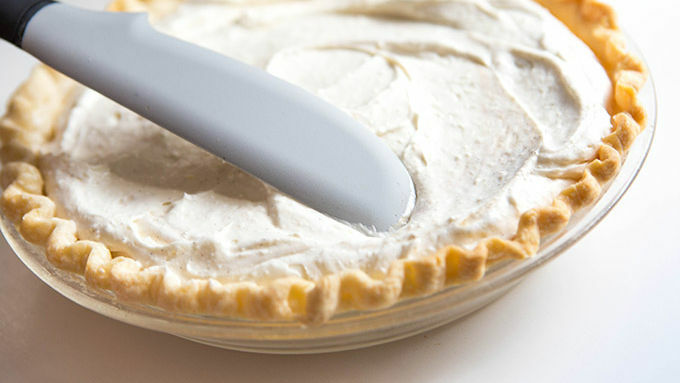 Once cool, spread on top of pie. 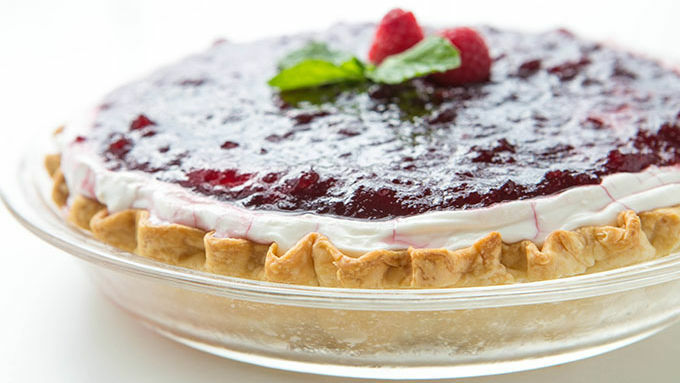 Cover pie and refrigerate an additional 1-2 hours, or until topping is set and filling is firm. This pie is a deliciously simple way to make an all-new treat that feels like a familiar old friend. The holidays are tip-toeing their way into our lives, once again. Time to all friends and invite them over for a feast. And because you like tradition, but always prefer to put a surprising twist on the table, this pie is about to take center stage on your dessert table. This is WORLD’S BEST PIE FILLING IN THE WOLRD. Tangy! Sweet! Like cheesecake, only without the cheese. And so much creamy sour cream, your heart will pucker. Which doesn’t sound like a good thing, but it totally is. When you come to preparing the topping, you’ve got two options. Making it around November? 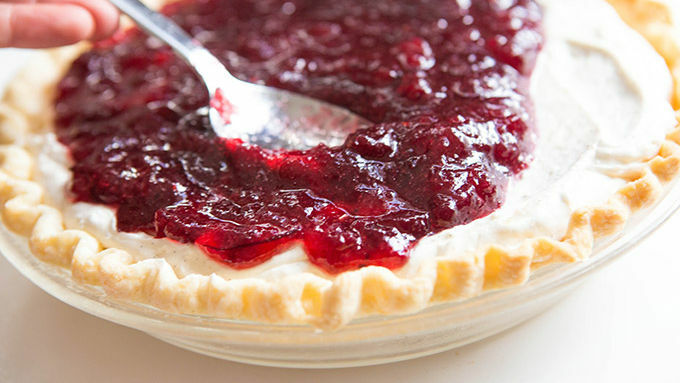 Grab some fresh or frozen cranberries to whip up the topping. Can’t find those fresh picked berries? No worries. A can of whole berry cranberry sauce proves to be a loverly alternative. With all the classic flavors of fall and thanksgivingness and party time cheer, this pie is a deliciously simple way to make an all-new treat that feels like a familiar old friend. 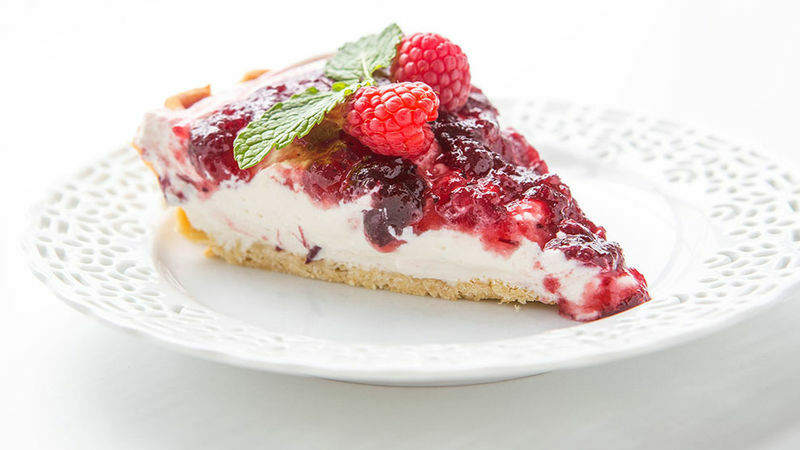 When the time for dessert has come, grab a pie slicer and heap yourself a happy slice. A touch of sweet, a smidgen of sour, a whole forkful of soo, sooo good. Enjoy!